Obama’s College-Ratings Plan -How will it impact HBCUs? Since taking office in 2009, President Obama has set a course for the nation to once again lead the world in college attainment as it did a generation ago. To help us meet this goal means ensuring all Americans have the opportunity to enroll and succeed in college. Our nation’s success in achieving this goal leads us to greater economic prosperity with a thriving middle class and a stronger, more secure democracy. As a key part of this plan, the President directed the U.S. Department of Education to develop and publish a new college ratings system by the 2015-16 school year that would expand college opportunity by recognizing institutions that: excel at enrolling students from all backgrounds, focus on maintaining affordability, and succeed at helping all students graduate. In response, the Department set out to design a ratings system that is clear, fair, and focused on a few key critical measures of institutional performance, while accounting for the diversity and complexity of the nation’s rich system of higher education. That said, many of the factors that contribute to a high quality postsecondary education are intangible, not amenable to simple and readily comparable quantitative measures, and not the subject of existing data sources that could be used across all institutions. Foremost among these are learning outcomes, which are central to understanding the value of an education but vary widely across programs and institutions and are communicated in many different ways. For many reasons—including the desire for simplicity of the ratings system, institutional autonomy and differences, and lack of shared approaches and data—it seems preferable at this time to concentrate on the core data elements addressed above and to allow institutions to provide additional information to prospective students as discussed below. Based on extensive consultation with stakeholders and experts, the Department has now released a draft framework for the ratings system for further public comment. We will continue to refine the ratings system over time based on user and institutional experience, input from the field, and the availability of additional data. To help colleges and universities measure, benchmark, and improve across shared principles of access, affordability, and outcomes. To generate reliable, useful data that policymakers and the public can use to hold America’s colleges and universities accountable for key performance measures. In the future this can be used to help align incentives for colleges to serve students from all backgrounds well by focusing on the shared principles of access, affordability, and outcomes; ensuring wise and effective use of $150 billion in financial aid. In additional to federal efforts, and those of individual institutions, we believe the ratings system can help inform policy, accreditation and funding decisions by states education authorities, policies and practices of accreditors and others. What Does the Draft Framework Cover? In addition to this summary, the Department has released a detailed explanation of the ratings framework. Graduate-degree-only and non-degree-granting institutions will not be included in the initial version of the ratings. Rating Categories: This will be a ratings system, using broad categories to highlight significant success and weakness, not a numerical ranking of institutions. The Department has received many comments that the ratings should be focused, clear, simple and avoid “rankings” and false precision. The Department is considering three rating levels: high-performing, low-performing, and those in the middle. This will allow the ratings system to identify institutions that are performing very well, and those that are weak or struggling, without suggesting more nuanced distinctions than the data can meaningfully support. For consumers, policymakers, and the public, the Department feels that identifying extremely high- and low-performing institutions using a simple set of key measures is the most valuable action the Department can take. Institutional Groupings: The Department has also received thoughtful feedback about differences in institutional characteristics and mission, and how those differences ought to be taken into account when rating institutions. Consistent with this feedback and the President’s goal to compare schools with similar missions, the Department will, at a minimum, have separate groupings for two-year and four-year institutions. The Department is also exploring several other strategies for grouping institutions together for comparison purposes. In addition to presenting four-year institutions separately from two-year institutions, the Department is considering accounting for differences in institutional characteristics such as degree and program mix and selectivity and are currently conducting data analyses to determine what, if any, more granular groupings could be used. Recognizing Improvement: Recognizing performance improvement over time would encourage and support progress toward the key measures. The Department is interested in exploring how the system should give credit to colleges that are demonstrating such improvement. What Data Will The Department Use? This first version of college ratings will rely primarily on data from federal administrative data systems and data collections, including the Integrated Postsecondary Education Data System (IPEDS), the National Student Loan Data System (NSLDS), and earnings information. All data used for the ratings will be used and maintained according to the highest federal privacy standards. No student-level data will ever be released to the public; all student data will be presented only in aggregate. What Metrics Are Being Considered? Percentage of students receiving Pell. The percentage of a college’s enrolled students who receive federal Pell grants would offer a simple, clear measure of access for low-income students. Expected family contribution (EFC) Gap. The Department is considering this metric as another way to gauge the degree to which institutions enroll students from lower-income family backgrounds. The EFC of students is generally considered to be a strong measure of whether a student comes from a low socio-economic status or high socio-economic status background. Family Income Quintiles. This is another possible measure of the institution’s enrollment of low- to moderate-income students. Like percentage of students receiving Pell, this would be simple and easy for consumers to understand. First-Generation College Status. The percentage of enrolled students who did not have a parent who attended college would reflect the extent to which institutions serve underrepresented populations in ways not measured by metrics based on EFC or family income. Average Net Price. This measure – the cost of attendance after accounting for all federal, state, and institutional grant aid – is one we’re considering using to determine affordability. It comes closer to approximating the amount that students actually pay to attend an institution than published tuition and fees. Net Price by Quintile. This measure offers a more accurate measure of the actual price paid by students of various family income backgrounds than average net price but is only available for those students who are federal student aid recipients. Completion Rates. College completion rates including the IPEDS Graduation Rate measure – which includes only first-time full-time degree- or certificate-seeking undergraduates – aims to capture of how well institutions support students in persisting and achieving their educational goals. Students who complete college also have higher earnings and are less likely to default on student loan debt than those who don’t. The Department is scheduled to publicly release IPEDS graduation rates for a broader cohort of students (including part-time and transfer students) beginning in 2017. The Department is also exploring the feasibility and reliability of an alternative to the IPEDS–based completion rate using data from NLSDS. An NSLDS constructed completion rate would allow us to incorporate completion outcomes for all federally aided students at an institution, including part-time students and transfer-in students. The data also allow us to construct completion measures for student sub-groups, such as Pell students, based on data from the FAFSA. Transfer Rates. Since, for many students, a two-year college is a step toward completion of a bachelor’s degree, ED is exploring the viability of measuring transfer rates as a positive outcome for students. Labor Market Success, such as Short-term “Substantial Employment” Rates and Long-term Median Earnings. Another important higher education outcome is ensuring students are prepared to students to successfully enter the workforce. Schools with comparable missions, student bodies and costs may have very different student employment and earnings rates, in both the short and longer term. The Department is exploring a variety of employment outcome measures that can provide critical employment information that appreciate those differences in ways that are sensitive to educational, career, work force, and other variables. The Department is considering looking short-term at measures that would determine if former students are making above an established threshold, such as 200 percent of the federal poverty line, while also stressing the importance of an individual’s potential lifetime earnings. In either case, the Department is committed to establishing measures that recognize the important contributions of relatively low-paying fields, such as public service, make to society. Graduate School Attendance. In addition to completion and earnings, the Department is considering including a measure of graduate school attendance rates of former students within a period, like ten years, from entry into a school’s undergraduate program. Loan Performance Outcomes. Relatively simple metrics like the percentage of students repaying their loans on time might be important as consumers weigh whether or not they will be able to handle their financial obligations after attending a specific school. The Department would like feedback on the best way to present the metrics. Rating an institution on each metric separately could make it easier to identify where an institution may excel and where it is relatively weak and may need improvement. As a result keeping the metrics separate may allow for a more nuanced picture of varied institutions. On the other hand, without aggregating the metrics in some way, information about an institution’s performance across multiple measures relative to the principles identified for ratings that comprise “value” may be difficult to assess for consumers and difficult to map in order to align incentives for an accountability purpose. Overall, the Department is considering how best to present the information about access, affordability, and outcomes in a way that increases transparency and meaningfully informs student choice. We welcome input from students, institutions and the public about the types of tools and formats that will meet this objective, as part of the system that the Department plans to release by the 2015-2016 school year. We will also conduct consumer testing on these tools, to ensure that the ratings can be easily understood by prospective students and other users. The Department invites comment from the public on the draft framework by Tuesday, Feb. 17, 2015. 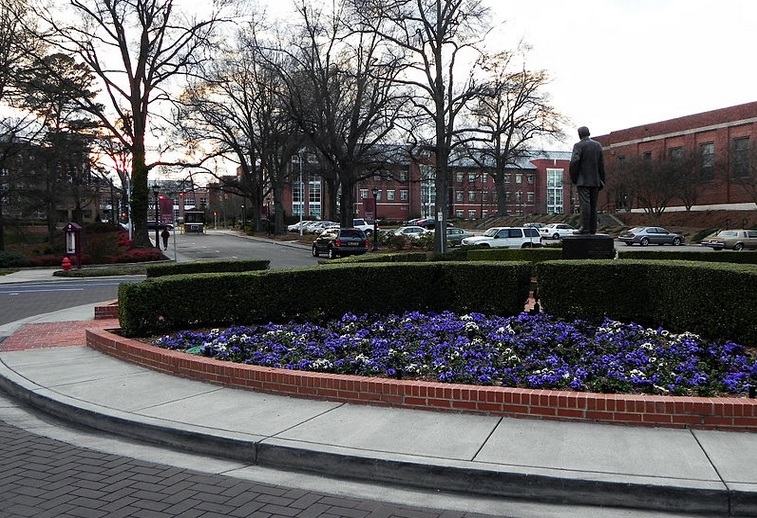 New funding models undermine the founding mission of many HBCUs — to provide education to all. Over the past five years, states have been overhauling how they fund public colleges and universities, tying revenue to student performance instead of enrollment. The goal is to motivate schools to improve the education they provide to students. But in reality, performance-based funding has undermined some colleges’ ability to do just that. These policies have limited higher-education options for low-income, first-generation and other types of at-risk college students. The consequences have been particularly severe among historically black colleges and universities (HBCUs), threatening their founding principle to provide higher learning for all types of students. Without thoughtful planning, these policies will continue to erode HBCU’s ability to educate those young people who benefit most from college degrees. The colleges themselves are suffering financially, too. Most states have not restored funding to their colleges and universities at pre-recession levels. 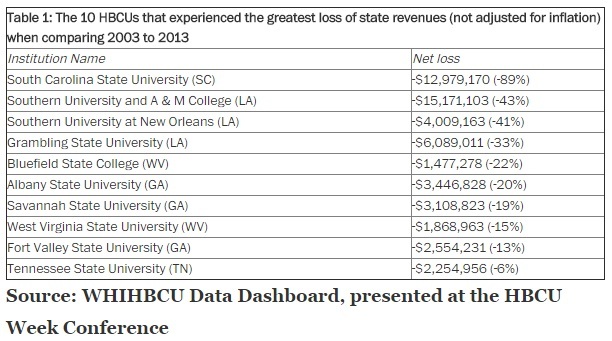 Fourteen HBCUs are receiving less revenue now than they received more than 10 years ago. ← Cuba: Afro-Cubans could gain from new trade relations with the U.S.